FLEXCUT WOOD CARVING TOOLS Designed for the Modern Woodcarver. Suitable for Beginners, Hobbyists and the Exacting Needs of Professionals. Premium quality "Flexcut" Carving Tools are made in U.S.A.
SPECIAL SAVINGS: Receive $5 CASH BACK on every $50 you spend on Flexcut Products!!! Click on Cash Back image below for full details. 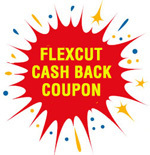 to Flexcut to receive your SAVINGS.